Dani Pedrosa took a commanding second win of the season at the Malaysia GP, although the result was completely overshadowed by a spiky clash between Valentino Rossi and Marc Marquez. Prior to the race, Rossi had accused Marquez of obstructing him during the previous round at Philip Island. Marquez’s alleged crime – deliberately getting in the way in order to help fellow Spaniard, Rossi’s teammate and main rival for the championship, Jorge Lorenzo. 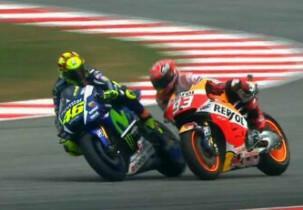 During the opening laps of the race at Sepang, Rossi and Marquez were locked in an intense battle for third position. Both riders traded places with a string of hostile passes as Pedrosa and Lorenzo broke clear. The contest was intense and physical. Clearly, neither rider was prepared to concede an inch. Rossi slowed down, looked over towards Marquez and ran his Yamaha alongside the Honda. Contact was made. Then, incredulously, Rossi seemed stab his leg towards the brake levers of Marquez’s machine. The Spaniard’s front wheel folded and rider and bike were on the tarmac. From the replays, it looked like the Italian kicked the Honda rider off his bike. Rossi eventually finished third, with championship leader Lorenzo taking second. Following an investigation by race control, Rossi was deducted three points. The multiple world champion will also have to start the Valencia Grand Prix from the back of the grid. Expect this saga to rumble on, as the protests continue. Can't help but think Vale is a lucky boy. He was sniping at Marquez throughout the week and let his previous race antics (whether deliberate or not) wind him up. 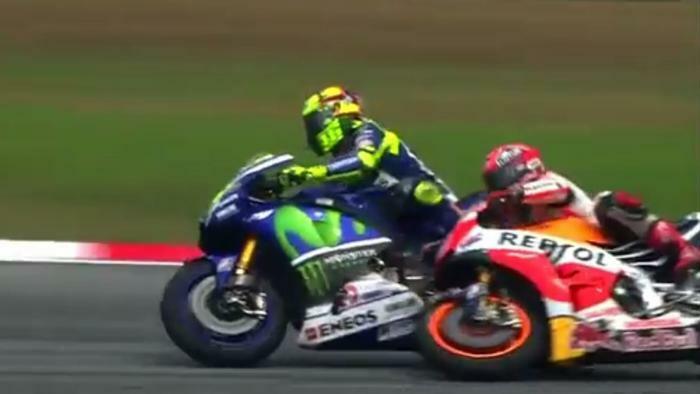 The passes and attempted passes by Marquez were very aggressive and Rossi lost it, in my opinion. It looks for all the world like he kicked out deliberately and was aiming for the levers / handlebars. I wouldn't be launching an appeal if I were Yamaha. Lorenzo has also sided with his compatriot, which will create a massive split in the camp yet again. He has done similar things before, was it Stoner a few years ago that he kicked off on the final lap? This is all iv seen on social media lately. IMO vale has been unfairly penalised, should he have slowed in the corner and pushed MM wide? probably not but the ''kicking'' incident was all on MM. He was on his way down before the second contact was made. MM should have just took a back seat and let him race his race instead of meddling!